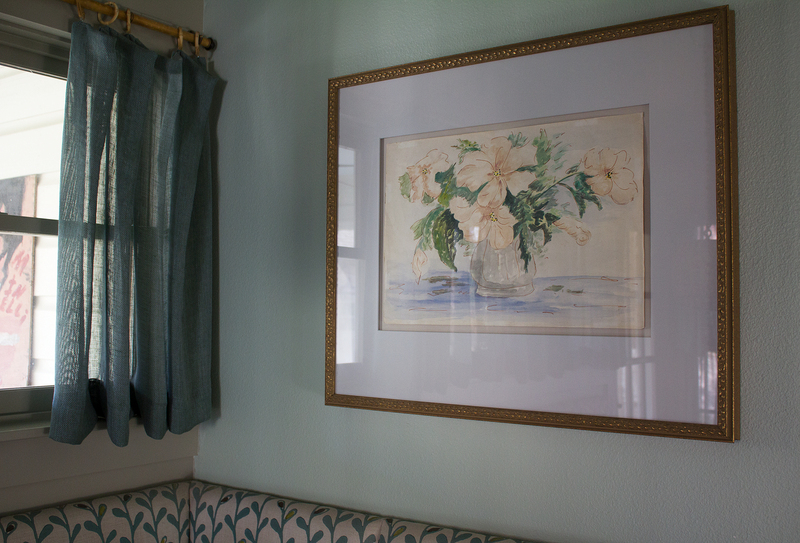 With all the windows in my breakfast room, it’s impossible to shoot this watercolor straight on. The artist is unknown, and it wasn’t a gallery purchase, but after three decades, it’s still one of my favorites. Two friends of mine were honeymooning in Mexico in 1986, when their cab driver on finding out they were architects pulled over to show them his collection of watercolors he had stashed in the trunk. Ellen and Karl were so impressed, they bought a few. And I was lucky enough to be given one of them on my birthday. I’ve lost touch with Ellen and Karl, but perhaps someone from HKS Architects will read this and let them know I still think of them. This is the porcelain vase I purchased from Bernardaud in Paris this past fall. Its orange colors along with the Bromeliad’s bloom help brighten this room. For some reason saving my photos to the sRGB color space intensifies the reds in a bad way. Sigh. The dining room, which is also my library, has always been difficult to photograph with natural light or any light for that matter. Both rooms face north and receive very little sunlight, but in wintertime with its leafless trees, more light is allowed to enter. So it was the ideal time to pull out my camera and photograph this space for the first time since the installation of the new Stark carpet. 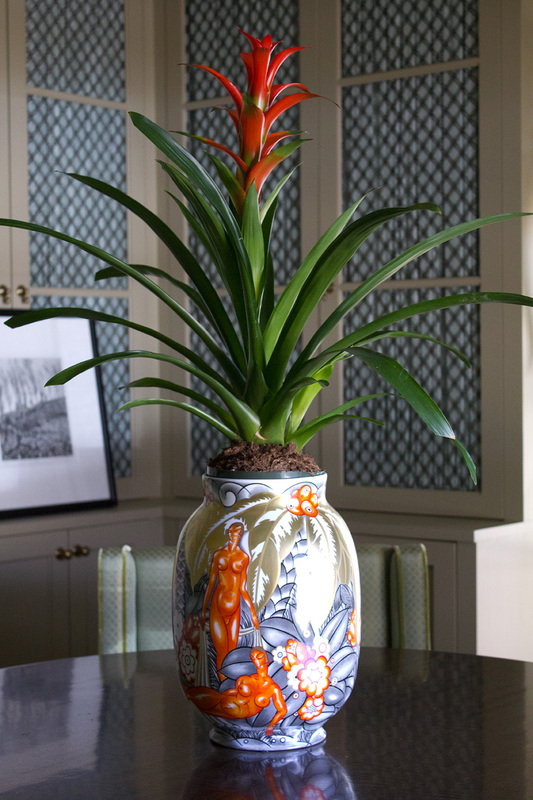 And of course, the lively vase with its feisty Bromeliad will provide a complimentary punch of color. It’s odd that the windows look like they’re frosted, but they’re not. The contrast was too much for the camera perhaps. Now that my living room has a new area rug, it was time to take new photos. It’s gray and cold outside, and I felt like I needed some indulgence to brighten up my workday. Even though I may be working across the hall in my office, I can still appreciate the sound and smells of a crackling fire. But this time, instead of heading back to work after adding the logs, I chose to procrastinate a little longer. 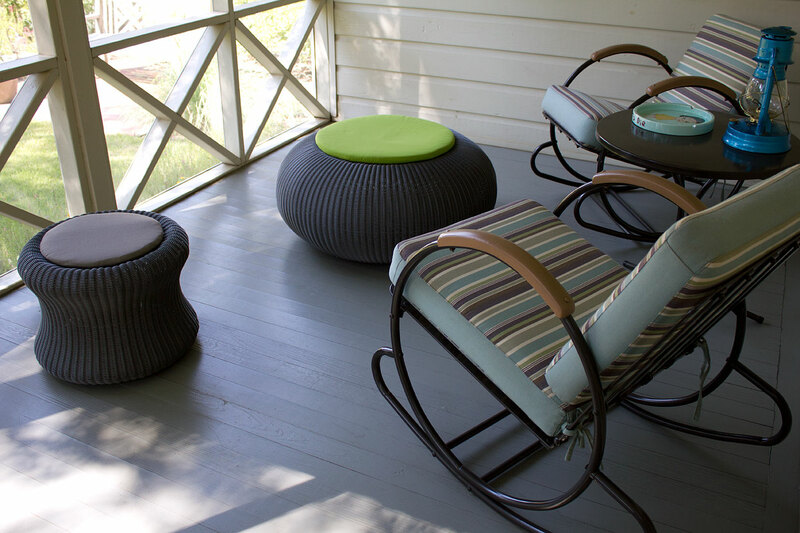 Hence these photos showcasing my new silk Stark area rug. 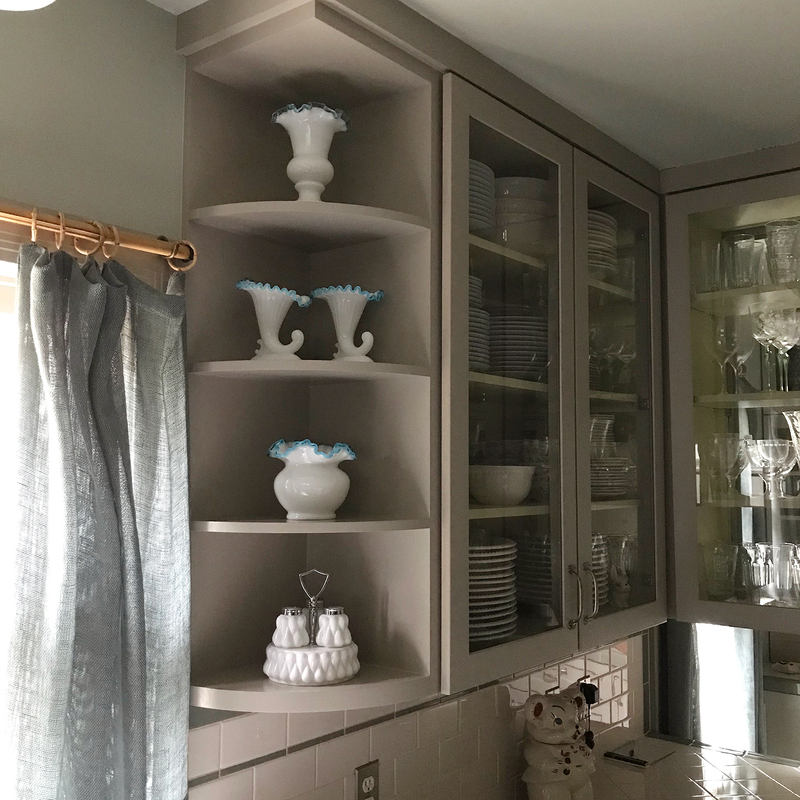 Click the link below for more photos of this space. Perhaps I overstyled this shot. It’s the soap I want you to focus on. A clean start can begin with soap, an especial soap made by the Texas Nuns of the Monastery of St. Michael the Archangel in San Antonio. I’ve been looking for an all-natural soap for my guest bathroom for the last couple of months. Most of the current natural soaps on the market were just too dang big for my vintage bathroom. I don’t care if they’ve been tripled milled and have crushed unicorn dust. If they don’t fit the original built-in ceramic soap holders, they’re useless to me. And what if a guest were to accidentally drop this massive soapy brick on his or her toes? I would have to make a 911 call and worry about a future law suit. Nope to big soap. About every two weeks I check in with Communication Arts to see their latest web design picks. One of these picks took me to a super cool site for a design agency called STITCH. It’s funny how poking around on designer websites can lead to cool products, and that’s how I discovered the nuns’ soap Nonnavita. STITCH had recently updated their logo and packaging, which you can read about in their blog post. Here’s how the nuns describe their product on facebook: Introducing Nonnavita! It’s super. It’s natural. It’s just darn good soap. What does Nonnavita mean? It’s a word we put together, from two Latin words: nonna, meaning nun, and vita, meaning life: A Nun’s Life. Our life. And that’s what you’ll support when you order a bar or two, (or maybe even five) of this great soap. Your $7 donation gets you one 4 oz bar of all natural soap made with certified organic ingredients. It cleans. It smells fantastic. It moisturizes – even here in San Antonio, where the water is hard as nails. Nonnavita. It’s super. It’s natural. It’s just darn good soap! Sporting bobbed hair, they look just like me on a thin day. 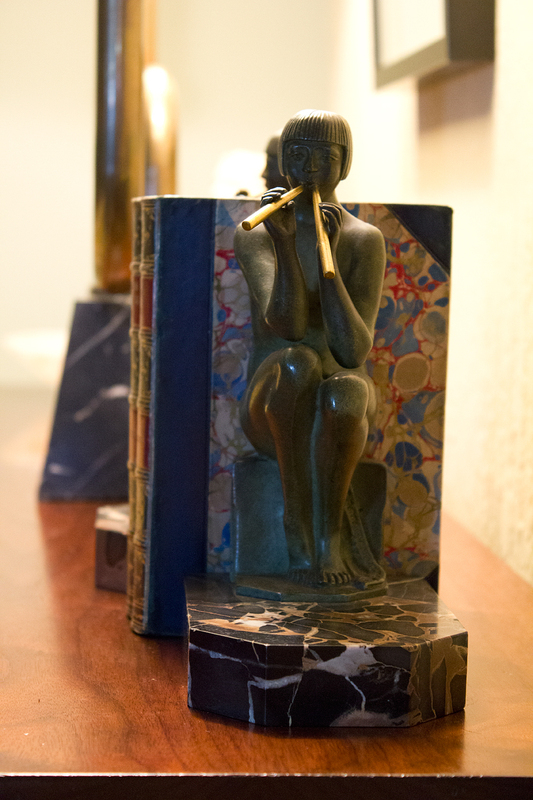 This pair of bronze Art Deco bookends is like the eye of the storm. It’s music you can’t hear, a little quiet moment during the holiday insanity. I wanted to start a fun post series showcasing a few unique Christmas tabletop ornaments that I have recently purchased, but I have had nothing but bad luck with shipping. Therefore, nothing to show you yet. A large glass domed piece arrived today shattered, because it had been packed within a styrofoam container which was then placed loose inside a much larger box. “Fragile” was written on the inside box, but not the outside one. Someone clearly left their brains behind after Thanksgiving, and more than likely, will not return mentally to their job until after Valentine’s Day. New and freshly laundered towels in my home’s original bathroom. With these new towels, my guest bathroom will officially be ready for business, but only after I buy some soap. Their contemporary style with the use of black bands, edging, and a sans serif font is the perfect foil to the toile de Jouy wallpaper. A solid white towel would have been boring, a solid color would have been too much competition, and monogrammed towels would have been too expected and perfect. 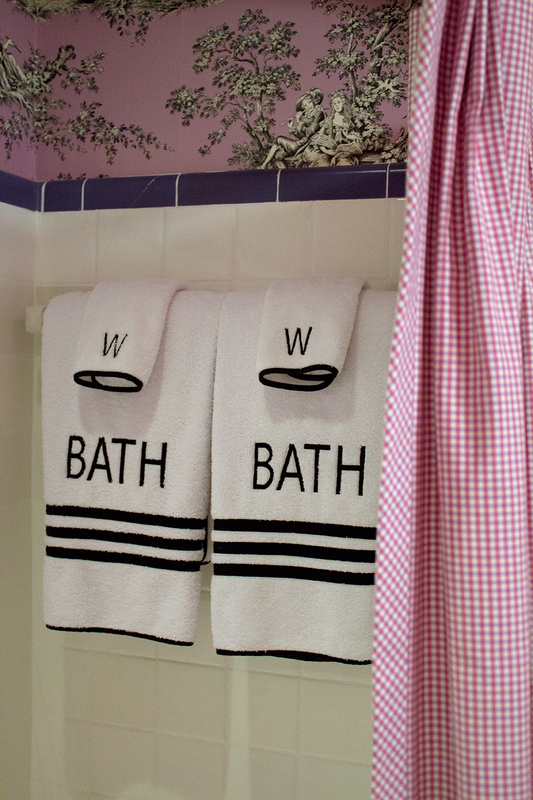 A serious towel in a quirky situation is the perfect combination. 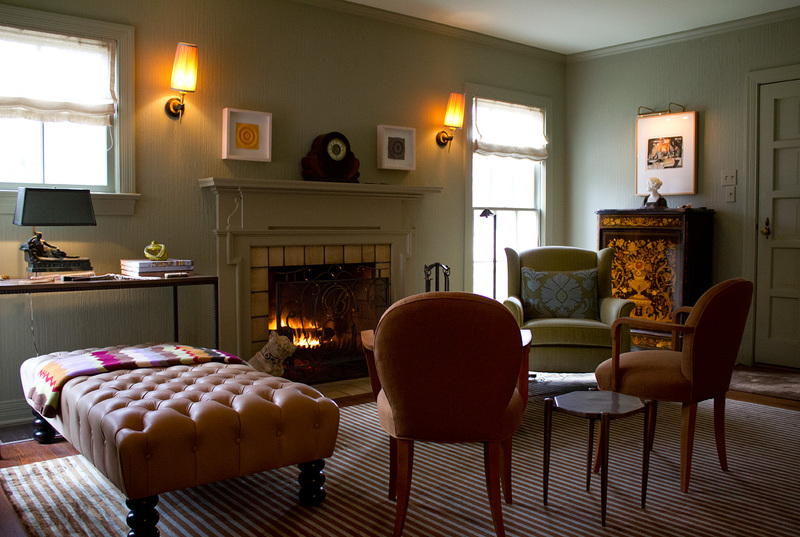 Bath linens were purchased through Neiman Marcus. 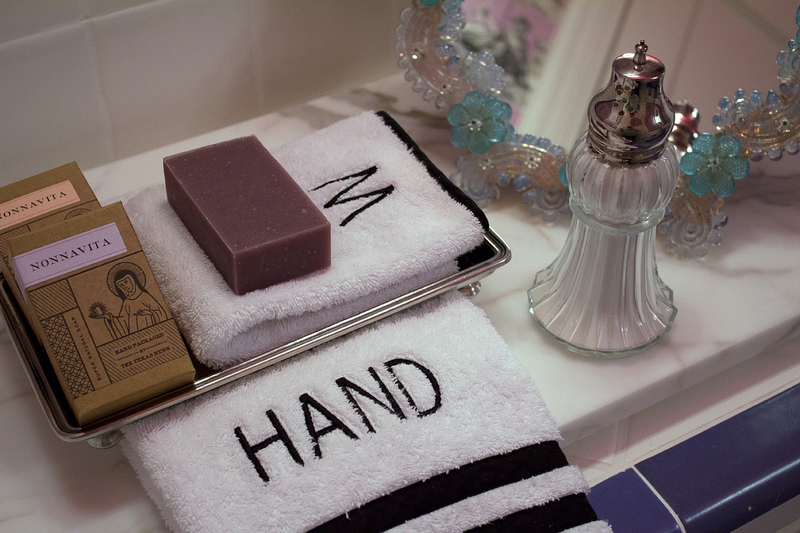 The original bathroom needed some essential accoutrements to make it functional for guests. So what did I do? Instead of buying soap, hand towels, bath towels, and wash cloths, the first thing I purchased was vintage linen finger towels that guests shouldn’t use. Not practical, but it’s a start. Made from a cotton linen blend, they are hand appliquéd with whimsical figures sporting comical enhancements. 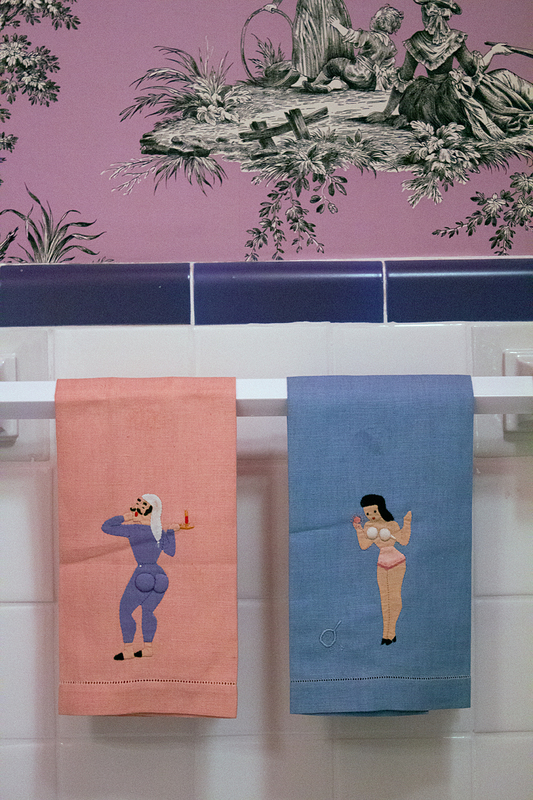 Risqué towels, such as these, were made in Madeira from 1930 until 1960 and are now considered highly collectable. I’m now in the process of looking for a third. These two could use some company to make this party complete. They’re a bit naughty, but oh so nice. This plaid/checkered pattern was the chosen option. The diagonal version, seen in the foreground, is the chosen direction the tiles are to be laid. 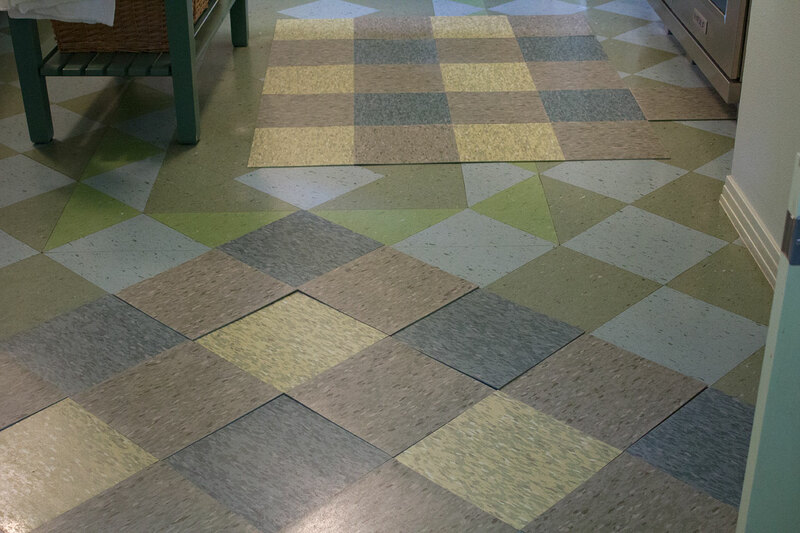 The tile is Tarkett Azrock VCT. After six years, my kitchen’s original floor tiles had started to shift and pop up. Two years ago my contractor had pulled up many of the tiles and new adhesive was applied, but this fix did not work. Before long the tiles began to shift again, and the gaps between tiles started to widen. The main problem is the wooden sub-floor with occasional dampness under the house (pier beam) causing the wood to expand. If the tiles had been laid on smooth level concrete, I wouldn’t have this problem. And if a super thick wax sealer had been applied after the first installation, the tiles would have had a much better chance on staying put longer.